�t is a two-storeyd building with flat roof and an arcade looking towards the road by the sea. The walls are built in the typical, local isodomic masonry. Very interesting is the structure of the interior, visible in the plans of the building. �t was built in the first period of the italian occupation (1925) and in its first phase it was richly decorated in a combination of the oriental and gothic styles. From 1936 onwards, when De Vecchi was the govenror, all the decorative elements were removed so that the facade was in accordance with the official architectural style of the state (Fascist Style). 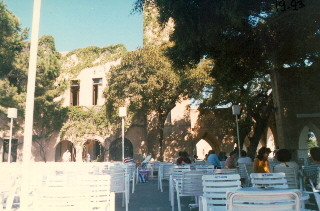 The building was called "Circolo Italia" and was used as a meeting place by the italian officers. Today it has been transformed into a coffee and pastry shop.